The Mayfly Climate Phenology Project is currently an Aquascience Consultancy Limited, Loughborough University, Wild Trout Trust, Beresford Fishery, Peak National Park Authority, Derbyshire County Angling Club, Staffordshire Wildlife Trust and Environment Agency collaborative project on the phenology of The Mayfly (Ephemera danica) in the River Dove in Staffordshire, UK. 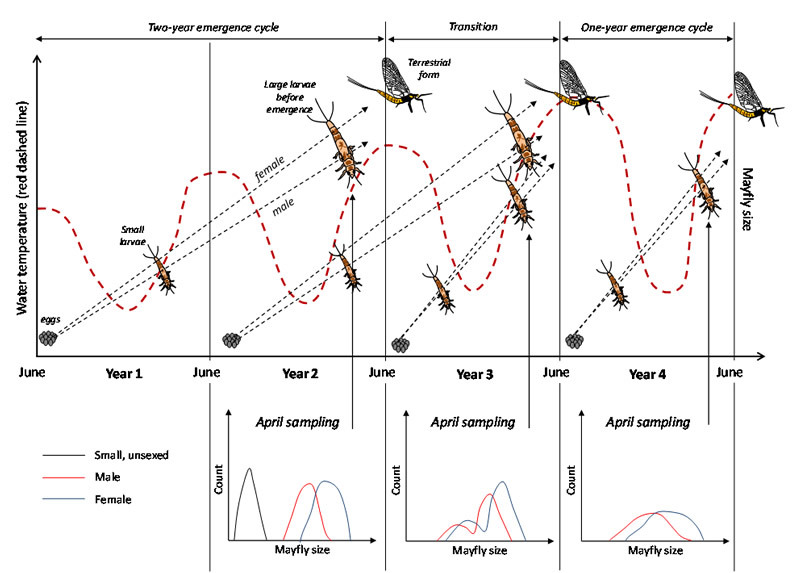 During the past 8 years of this study The Mayfly (Ephemera danica) populations of the thermal test site have gone from a 2 year cycle to a 1 year cycle and back to a 2 year cycle dependent upon the receiving river thermal regime but remained un-altered at the reference site where river temperatures remained stable. The initial cycle of detailed change in the phenology of Ephemera danica from a 2 year to a 1 year cycle in the River Dove in Staffordshire in the UK is shown in the schematic data cycle below. Data from the present study suggest that habitats near cool groundwater may provide important refugia for populations of insects, potentially delaying permanent shifts in phenology under climate change. Anyone interested in providing funding to allow us to widen these climate phenology studies should contact us via the website contact details. 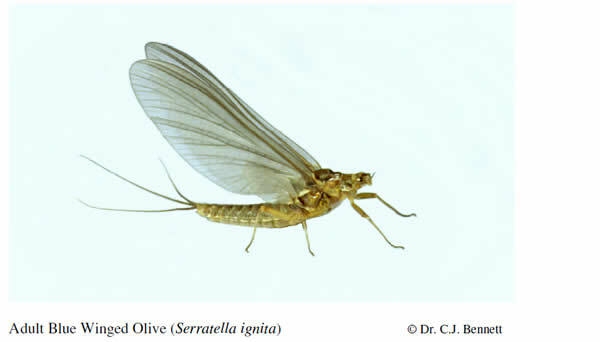 Such funding would allow us to pick up our Blue Winged Olive (Serratella ignita) mayfly studies in the Rivers Manifold and Wye in Derbyshire in the UK where findings had highlighted that Serratella ignita had become multi-voltine in northern UK rivers and was over wintering as mature nymphs rather than the traditional view of this species being uni-voltine and over wintering as eggs in the UK. Similarly, any further funding can be put to vital use in widening our currently largely voluntary studies of the southern Pennine distribution of the only arctic-alpine mayfly found in Britain in the form of the Upland Summer Mayfly (Ameletus inopinatus). From our distribution data to date it was apparent that, as the only aquatic arctic-alpine mayfly species at the southern edge of its UK distribution, this species will serve as an excellent sentinel indicator of any impact of climate change on our upland waters.